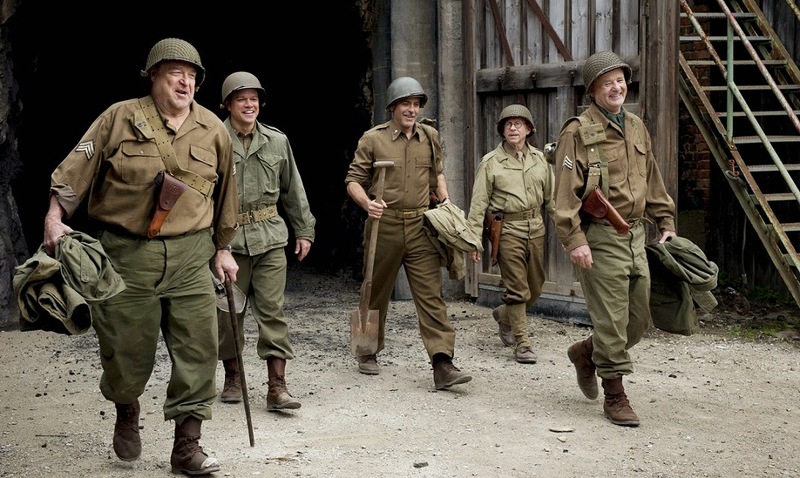 I should have loved Monuments Men. It had so many things in it that I usually love. The cast is great. The idea is solid. The production values are first rate. And it's obvious this film was made with the idea of creating something lasting rather than yet another Big Shiny. But this film just bored me. Sad. 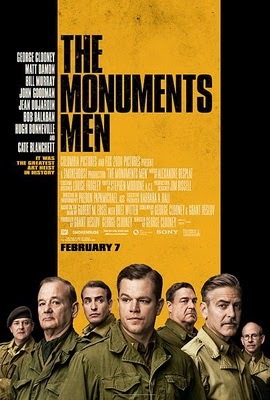 Loosely based on the non-fiction book “The Monuments Men: Allied Heroes, Nazi Thieves and the Greatest Treasure Hunt in History,” Monuments Men is the story of a unit of Allied soldier during World War II, who were assigned the task of tracking down all the great art works the Nazis plundered from the lands they conquered and to save them from destruction as the war came to a close and the desperate Nazis were destroying or hiding these things to cover their tracks. The unit, called the Monuments, Fine Arts and Archives Program, was created by FDR at the urging of Frank Stokes (George Clooney), who convinced FDR that letting the Nazis destroy the artistic history of Western Civilization would amount to a disaster, even if the Allies won the war. Stokes is directed to assemble a unit of museum directors, curators and art historians to find these treasures and make sure they are ultimately returned to their rightful owners. Joining him are the likes of John Goodman, Bill Murray and Matt Damon. The film follows their efforts. 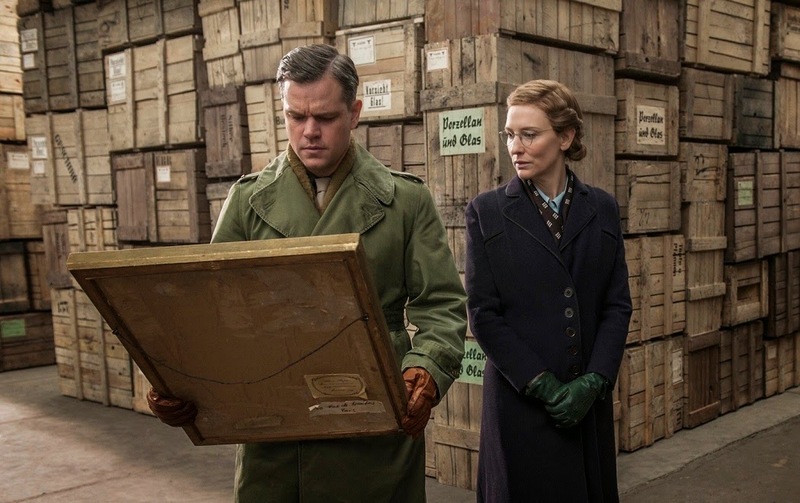 On the other side of the story is Claire Simone (Cate Blanchett), a French museum curator who has been forced to assist Nazi Viktor Stahl as he finds and steals great art for Hitler and his cronies like Goering. Her brother is a resistance fighter who seems to specialize in stealing these items back. The film is largely disguised episodic in nature with a loose narrative tying these events together. The main theme seems to be the resistance of regular soldiers to helping Clooney's team, and the plotlines tend to involve them learning the location of some missing art and then going to find it. 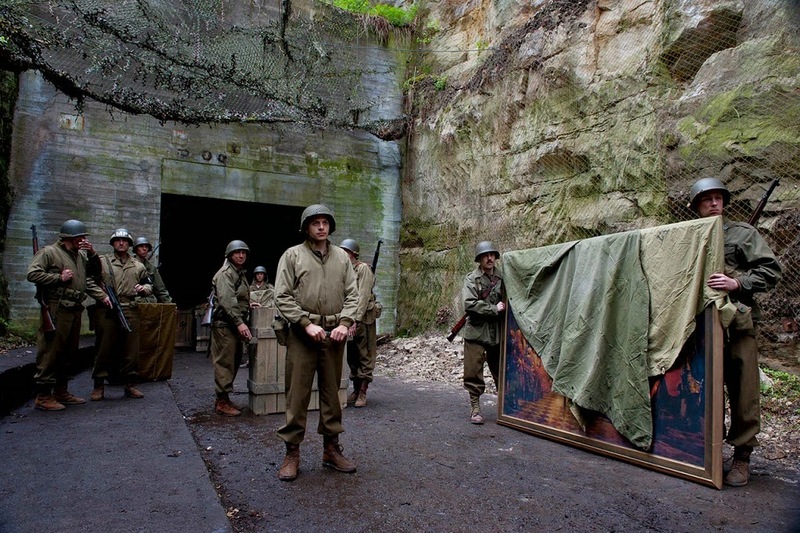 Toward the end of the film, the team discovers that the Nazis are hiding vast amounts of art in abandoned mines. 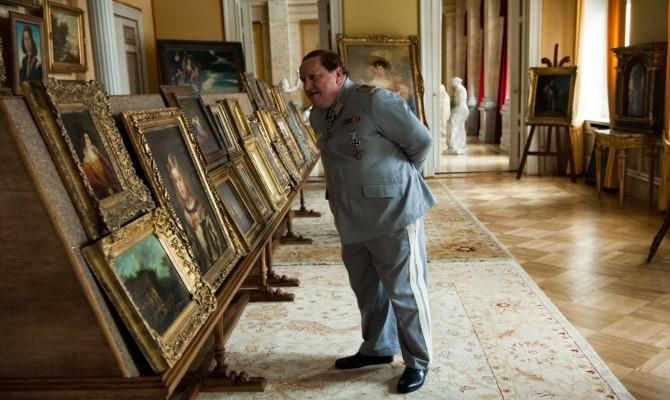 They must get to this art before the Soviets do, or the Soviets will steal it and take it back to Russia as a “war reparations.” They also capture Stahl and there are a couple moments where they briefly walk into combat scenes. The film received mixed to negative reviews. The Guardian said there were too many characters and the film never felt satisfying because it sent them all off to do little tasks, which often weren’t that interesting. The consensus at Rotten Tomatoes was that the film has “noble intentions” and a great cast, but they couldn’t overcome the “stiffly nostalgic tone and the curiously slack dialog.” Some Spanish rag called it “Hollywood war propaganda.” Yeah, leave Hitler alone, Hollywood! On the other hand, Rolling Stone liked it, calling it a movie about “aspiration” and “a proudly untrendy, uncynical movie.” Talk about true irony! Rolling Stone peddles pure cynicism and always has. In any event, many of these critics have put their fingers on part of the problem: this film relies too heavily on its premise to sell the film rather than its execution. This was the same problem in The Family, which I reviewed recently, and with most of Clooney’s other recent films. Look, I like Clooney and I want to like his films, but in film after film it feels like he thinks that the concept itself is strong enough that he doesn’t need to offer more than his character walking through the film, discovering the concept and then acting upset or outraged at what he discovered, see e.g. Syrianna, Burn Before Reading, The Men Who Stare at Goats, Solaris, Michael Clayton, etc. These are all films with great concepts, solid casts and much promise, but they underwhelm as they end up more like a series of vignettes rather than real plots, and they rely on the audience feeling shocked that such things exist rather than feeling entertained by the plot. Shocking audiences with something they never guessed existed before is a great start to any story. 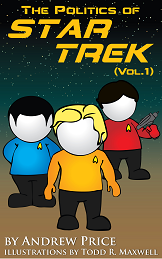 In fact, if you can find such a story premise, you are a major step ahead of all the formulaic crap out there. But that is only a beginning. 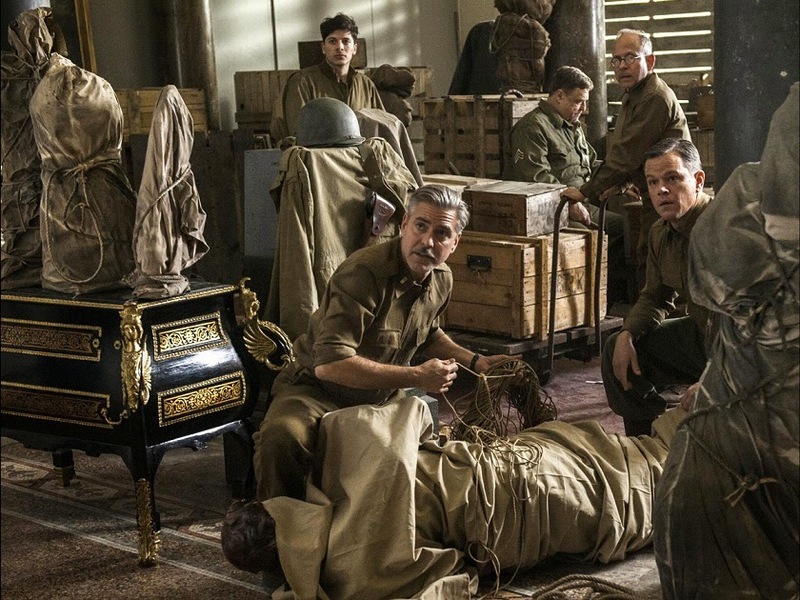 For Monuments Men to be entertaining, they needed to develop the characters, put them into some sort of situation of conflict, and take us on that journey to resolve it one way or another. This film never does it. For starters, as noted by the critics, there are too many characters for us to focus on which characters to care about. They try to make up for this by giving us actors who come with a history of goodwill already in place. This includes guys like Bill Murray and John Goodman and Clooney himself and Matt Damon. But liking the actors doesn’t compensate when I can’t tell you who the characters they played are or what they did. Moreover, I have to say that my goodwill for Murray and Damon is long gone and my goodwill for Clooney is waning. So the audience doesn’t know who to care about or why or even what they really do that the others don’t. And that’s the next problem: we know in a broad sense what these guys do, but the film never manages to make it seem challenging. To the contrary, they seem to get tips from out of the blue. They never need to fight their way into those areas. The other American soldiers don’t seem to like them, but they don’t really stand in their way. The Nazis all surrender quickly and seem harmless as villains. Even the race against the Soviets is never presented as a race so much as a theoretical challenge. The end result of this is that characters you don’t know or care about follow tips that seem to fall from Heaven and are always right to go pick up treasures with no genuine obstacles standing in their way. That’s not exciting... it’s not interesting. I honestly suspect that a documentary would have managed to be more exciting than this film turned out to be, and that’s sad. Good review, I liked it but wasn't excited about it overly much. It was actually a new story about WWII which is surprising this long after the event so I was hoping for more. Thanks Scott! I wanted to like this so much more than I did. It's not that it's horrible or anything like that, it's just dull and feels lifeless. I too was surprised to see a "new" story about WWII. Especially with all the documentaries and the such out there, it feels like we know everything. So it was nice to learn about something new. Pike, There's never been a war where issues like that and other issues totally apart from destroying the enemy wherever he may be haven't placed limits on the conduct of the war, be it preserving art, protecting elements of the infrastructure, protecting civilians or conquered populations, world opinion, etc. War is an extension of politics after all, not something done for its own sake, and the goal of war is generally to defeat the enemy in a way that also grants a political victory. I would think that creating a volunteer group to preserve art would be a fairly savvy thing to do, even if that means risking lives to do the task. I was so looking forward to this movie - I just loved the idea and it's the kind of thing I might've done if I were a filmmaker. The critics were savage and part of me thinks it's because they were expecting something a little more "prestigious" from Clooney. What they got was a pretty straight-forward WW2 tale. Even the score pays homage to Elmer Bernstein's The Great Escape. But the critics were actually right this time. It's a bland movie that really just meanders. The characters are all archetypes (which is not necessarily a bad thing), but they're all so boring (bad thing!). And it's all so... one-note. Okay, they need to accomplish X, Y, and Z before the Russians get there but there's no sense of urgency or This Needs to Happen Now! And the attempts at humor are pitiful. Scott, I agree completely. I never trust the critics,but this time they were right. I was expecting something more complex, more tense, more dramatic. Instead, scene after scene is devoid of any sort of drama. Basically, they are given tips, which are always accurate. They go. The art has been secured for them. They take it back to HQ. No risk, no challenge, no possibility of failure. Even the bit with the Russians never turns into anything. Yes, we are told they need to beat the Russians, but we don't even know if the Russians are looking for this stuff, much less do we get any sort of elements of a race. well, Andrew, I never planned to see this because I have gotten so fed up with guys like Clooney and Damen getting the big films, that I feel like I am helping to donate to "ready for Hillary". Still, I did see where it got pretty poor reviews, and your comment as to why (at least in part) makes sense. That is, the film was created and produced to be a blockbuster. Big "A" list cast, patriotic theme, slightly different point of view, etc. But, they got too caught up in making it a best seller, they forgot to make a good film. Sounds, so logical. But, I must say I am less a fan of Clooney than you. Oh he can be good in a certain type of role, and has had a few good films, but he is such a "star" that Clooney playing Clooney doesn't work nearly as well for me as, say, Hackman playing Hackman. Then too, one other thing comes to mind, and I don't know if I'm being fair, but it seems to me that Bill Murray has gotten over-exposed. Look, he has been a great comedic talent, and done a somewhat credible job of transitioning into more diverse roles. But damn, he is everywhere ... hosting rock concerts, being a CELEBRITY, and being in what seems like every other fricking film that comes down the pike. To a lesser extent, I feel that way about John Goodman. This season, about the only three films that excite me are 1) see how Angelina handles directing a blockbuster oscar bait film 2) Seeing how Steve Carrill performs in "Foxcatcher" a dramatic role about one of the DuPont heirs who murdered an olympic wrestler. That happened very close to where I lived, and I used to drive by the crime scene all the time. 3) The Judge. 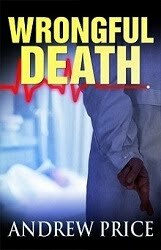 I want to like this, but the critics have panned it. Is it to screw Rovert Duval for being Hollywood Incorrect? Or is it, like Monument Men, truly rotten? Jed, I can't disagree. Their politics certainly leaves a huge distaste in my mouth and too hate the idea of giving them money, which they can then use against the things I believe this country needs. That said, I still do like Clooney on film... except that he's starting to wear on me because he isn't picking out good films anymore. This is a great example of how he works: he finds films with great premises, but totally underwhelming executions. So you end up lamenting the potential. As to Murray, yeah, he does suddenly seem to be over-saturated. But even worse, he always seems to be saying nasty things, and that has worn away my goodwill. As to this film itself, I don't think it's rotten, it's just dull. There is nothing here that ever grabs your attention or makes you care. To the contrary,it keeps undermining its own efforts in that regard. So… good concept but poor execution? The book was fantastic...it almost read like a novel...the film translated the big ideas but was too episodic for me...too many small vignettes...the story is truly amazing and some of the struggles the actual Monuments Men went through to save history are inspiring. 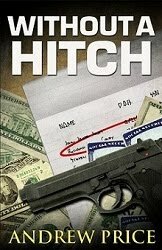 I felt the film was too short to get the over-arching story across and as you said, too many characters to keep track of, although there are that many in the book. The book presents the whole thing as a race against time (which it was) because the Nazi's torched a lot of art that they couldn't take with them but didn't want the Allies to have back. I didn't feel that sense of urgency in the film. Kit, Basically. The idea is intriguing, but the execution was really poor. Voz, That was a big problem: there was no sense of urgency. At no point do you ever feel during the film like they need to rush. Everyone moves slowly, there are no "competitors" shown against whom they race, there are no races, there are no close calls, etc. It really does feel like it's just some guys who were tasked to drive around and pick up art. I started to comment just after this post hit my reader, then thought I'd wait and see if a comment was explained. I watched the movie a few months ago and was totally underwhelmed. I didn't regret seeing it, but didn't think it was anything special and was a little disappointed because I thought it could have been so much more. I rated it a "5" on IMDb, probably a little generous towards it. It was the comment about Murray that made me curious and want to ask the question "What has he said that's made you lose your "goodwill"?" I did a quick search and found nothing he has said that I disagreed with. (as I said, I didn't look too long, so....) I did find some comments where he said the thought Americans have lost their way and their sense of responsibility for self and that sounds pretty conservative to me...at least it's something I agree with. Just curious, Andrew - I've always liked Murray's movies and he's seemed to be an OK guy from interviews I've watched, but I don't idolize him and truth be told, I value your opinion as much if not more than his. I just don't recall ever hearing or reading about him making outlandish political statements ('nasty things"), ala Clooney, Penn, Sarandon, etc. Mike, Sadly, this may not be a great answer, but it's just a general feeling. It seems that in every interview I've seen with him over the past 10-15 years, he comes across as bitter and kind of insulting. It's a hard thing to put your finger on anything specific, but it has been a consistent feeling. And I admit that may be a wrong impression, but that's how he's come across to me for years now, and it just wears down my interest in seeing him on film. Add in that he seems to be mailing in his roles now and I really just don't seek out his films anymore. Andrew, once again there is really nothing I can take issue with in your review, but the wife and I liked the movie just the same. It felt more like a docu-drama to us, and not just typical Hollywood storytelling to us. From a movie storytelling stand point, they should have focused on finding a single artifact- say "This is the story of a band of courageous adventurers attempt to rescue the Mona Lisa from Hitler's SS!" Instead it was several stories of people trying to save any stolen art they could. In the end, it was enough for me and the wife as both agree that art and history need to be preserved. Still, I do understand your disappointment. Fair enough, Andrew. I'm glad to see there are others like me who have trouble separating the actor from their private life or politics. I wouldn't argue w/ anyone that Sean Penn is one of the best actors of this generation, but it's so hard for me to watch him be so brilliant on the screen and not remember his ignorant statements and anti-American actions. I was really disappointed to find that Charlize Theron was in the new Mad Max flick - she's so gorgeous and talented, but it honestly made me nauseous to find that she'd taken up w/ Penn. Speaking of "bitter and insulting", David Letterman fits that description as well. I used to work evenings on drilling rigs and would get up "early" to watch his morning show, then when he moved to nights, would hurry home to watch the last of his show. I'm not sure just when he turned into a bitter and insulting a-hole, but I can't stand to watch him now and am glad he's retiring. Anyway...as much as I love movies, I haven't been to a theater in years. I watch on TV, wait until the DVD hits the bargain bin or find a website that has the newest movies. Maybe that last isn't quite ethical, but I think my ethics are damaged more by knowing part of my movie admission fee went to far left causes or directly to the Elect Hillary campaign. Mike, Yeah, I run into the same thing. I can ignore a lot, but there comes a point where it adds up to too much, or sometimes they just say or do something that really hits a nerve and that's the end... I can't separate the actor from their off-screen behavior anymore. Matt Damon is a great example of that. Around Katrina, he said some vile stuff about America and that was it, I was done. All I can see now when I see him is an a-hole who hates this country and its people, and I don't want to support him. And I feel the exact same way about Sean Penn. He was a great actor in great roles who pushed things too far and now I despise him and I have a truly hard time seeing him on film. I know what you mean about Letterman. Somewhere along the way, he suddenly became a bitter, bitter man, and I can no longer stand to watch him either. I have nothing against people sharing movies. If Hollywood wasn't trying to rip us off by vastly overcharging for films, then I might have a different opinion, but people stealing from crooks doesn't bother me in the least. Shawn, Thanks! As I said, I didn't hate the film, I just felt disappointed, especially at the lost potential. This could have been an excellent film, and I agree that focusing on one item might have been the best course to go.